Barnett brings a technical style to the octagon that Nelson just doesn’t possess(doesn’t like to*). He is going to lull you to the mat with his grappling skills and strength, then proceed to use his wrestling skills to finish you off. Lets be real though, this guy has some serious expenerecne that he brings to the table that really is only matched by the guy on the other side of the octagon. Second, his strength really isn’t something for anyone to test. Barnett is going to definitely want to get in close and grapple with Nelson because even with how tough Nelson is, I just don’t think he has the skills tomes with Barnett is that area. Last, are the wrestling skills. If this fight is taken too the ground consistently, it is tough for me to justify anyway that Nelson comes out a victor. Barnett is just too experienced not to win a fight when fighting the style that gives him a serious advantage. 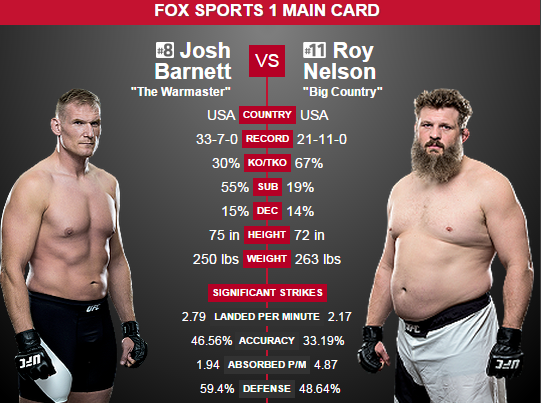 Roy Nelson is going to be looking to brawl. Roy isn’t looking to do anything other than stand on his fight and exchange blows. With some of heaviest hands the UFC has ever seen, why would his game plan ever change. People have said, maybe he should get into shape, Roy said no thanks. Now, don’t get me wrong, Roy can grapple, and has been known to submit a guy here and there. He could surprise us with a possible take down but the only way I see that happening is if there is an absolute plan. If something were to go wrong with it, he’ll abort immediately. With that said, I don’t see him taking too many chance on Saturday. My advice for Roy would be to attack from a distance and brawl. He can win this fight on his feet, but I think it might be the only way. I see Nelson coming away with this one. I think he’s able to stay on his feet and brawl his way to a victory. I see it coming in the second round after Nelson detracts Barnett take downs and lands a barrage of punches via second round stoppage.